-- Structures:1 main pocket + 4 functional pockets + 1 Hidden Waterproof Compartment ,The main pocket is large enough to put your clothing, books and your daily things.4 functional pockets can be used for your tower, brush, umbrella and so on.It is your necessary bag when you are out for travel, business and work. Big capacity of the backpack can well store your daily needs when you are outside or school. -- The flap can be hidden if you need a fashion Handbag. The straps are webbing and adjustable . -- Recommended people:Those who love traveling, gym, cycling, go hiking and go camping,etc. -- Waterproof function: The backpack is made of waterproof nylon material. So having it, you don?ˉt need to worry about rain or water anymore. -- Suitable occasion: Take it when you do sports, when you do Photography, when you hiking, when you travel,when you do business to other place. You will find it fashion, easy, convenient, clean andlight weight to carry. 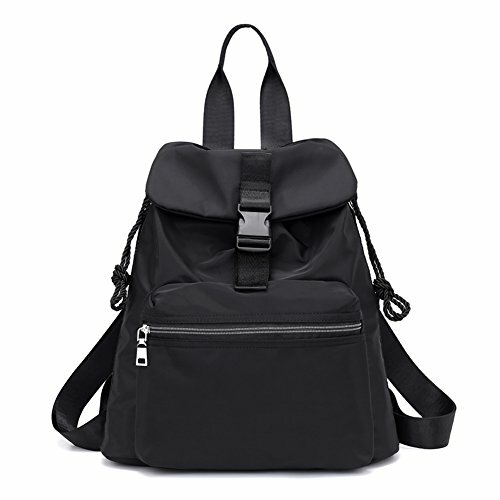 ❤ MULTI-FUNCTION BAG- It can be used as Backpack/Shoulder Bags/ Handbag /Tote Bag/Top Handle bag, stylish and thoughtful.Enclosed by a drawstring when you wear it as a backpack. The Flap can be hidden If you need a fashion Top Handle bag or a handbag .Outside:1 Zipper pocket on front,1 open pocket on back ,Indside:1 Phone case and 1 key pouch,1 zipper pocket.One waterproof compartment on side . ❤ CAPACITY EXPANSION- There are two zippers on Each side of the bag ,you can open it when you need more Roomy to contain your Clothes,gym towel, swimming suit,campping mat or other gym accessories. ❤ AVAILABLE FOR ANY OCCASION AND AGE: It's would be a great portable useful bag when travelling or going on trips . It's not too big but enough to hold all your items books, binders, folders, laptops and clothes, simple and practical, suitable for outdoor activities, school, day trips, vacation, travel, hikes, camping and shopping etc.It is very light so easy to carry. You can use it for business, school, travel, work, sports for men, women, boys, girls.